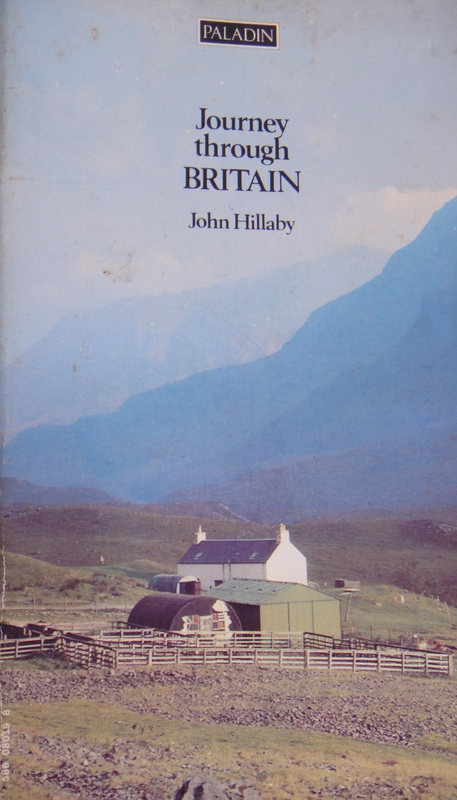 In an earlier post I mentioned my affection for John Hillaby‘s ‘Journey Through Britain‘. As promised, here’s a little more on this wonderful book. The Britain discovered by John Hillaby on his walk from Land’s End to John O’Groats in the late-’60s may well, for all I know, already have vanished. I haven’t been there, but he seems to predict its fading in the final pages of ‘Journey’, noting that open country is diminishing rapidly but concluding, a tad warily, that many parts of Britain are still inexpressibly beautiful. Inexpressibly? I don’t think so. The traverse of Britain between its southwest and northeastern points has been done innumerable times, on foot, and on wheeled contraptions ranging from bicycle to skateboard to wheelchair. Hillaby’s skill lies in vividly and effortlessly expressing the wisps of natural, social, ancient and modern history that float through his journey, one of the earliest well-documented ones in modern times. So early was it, in fact, that he refers to encounters with blue-jeaned beatniks in the early part of his walk! The book starts slowly. Its author provides little in the way of preamble or motivation — he basically just starts walking — but is quickly diverted by excursions into the history of early Britain as he moves through the mysterious ruins of Cornwall. Tension builds at times, such as his description of being stymied by impenetrable marsh in creepy Dartmoor, but Hillaby comes across, overall, as one of those imperturbable English explorers for whom no challenge is a true impediment for long. From Cornwall to Callander I had grown used to my own company; I liked the feeling of being self-contained, but for most of the way I knew that villages were rarely far away. This is not so in the Highlands. I travelled not merely alone, but often without seeing a soul from one desolate glen to another. I drank two or three pints at lunch-time and a similar amount at night, sometimes more to slake a prodigious metabolic need for liquids. I not only drank a fair amount; I ate more than I have ever eaten before. Hillaby endured his share of minor hardships (rain depressed me and mist I feared) and nights sleeping rough in fields, but he was just as inclined to pay for meals or beds or baths in villages along the way. He doesn’t display any desire to “prove” or “discover” himself; his goal, it seems, is to re-discover the Britain that seemed already to be slipping from view or memory for many urban Britons. On long walks, as every walker knows, there comes a point when the conscious effort of shoving one foot in front of the other disappears… He can tackle hills or go faster with the confidence of the driver of a powerful car who knows that by a mere touch on the accelerator he can pass almost anything on the road. But mostly he reserves his attention for the people and landscapes he encounters. The closest Hillaby comes to deep analysis of his motivations is in the closing pages, in remote Scotland, 10 miles from journey’s end. Someone had asked him why he was walking — any long-distance walker has fielded, or evaded, this question dozens of times — and his inability to answer seems to gnaw at him. Ten miles to what? To a mere name on a map? What had it all amounted to? But these doubts don’t last. Walking is intimate, Hillaby concludes. It releases something unknown in any other form of travel and, arduous as it can be, the spring of the ground underfoot varies as much as the moods of the sky. By walking the whole way I got a sense of gradual transition from one place to another, a feeling of unity.The mosaic of my own country and its people had become a sensible pattern. Evidently he enjoyed that “spring in the ground underfoot”. There are half a dozen other ‘Journey’ titles set in Europe, Africa and elsewhere. Yes, my favourite parts are those rare glimpses of self-doubt near the end. I wonder what a blog by Mr Hillaby would be like if he were still around… I recommend his book about walking through Europe as well – it’s kind of perversely fun to watch his implacable self get quite frantically placable in the mountains near Geneva! Next PostArt & Affirmation on the A.T.